One year ago, Google acquired Slide, a company that developed third-party apps for Facebook and other social networks. At that time, Google mentioned that the goal was to "make Google services socially aware". Slide continued to operate as an independent start-up inside Google and developed photo sharing apps like Photovine and Pool Party. Slide's CEO, Max Levchin, became VP of engineering at Google. New York Times reports that Max Levchin will leave Google and most of the Slide apps will be discontinued. A Slide blog post confirms that "in the coming months, a number of Slide's products and applications will be retired. 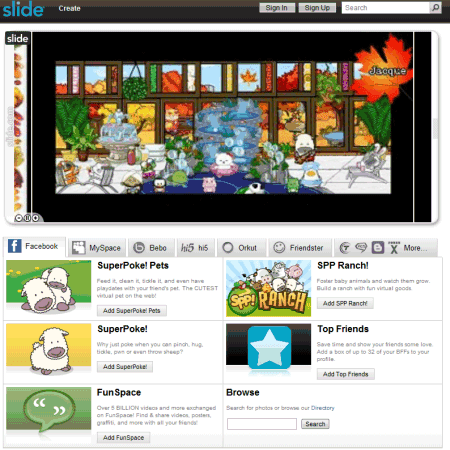 This includes Slide's products such as Slideshow and SuperPoke! Pets, as well as more recent products such as Photovine, Video Inbox and Pool Party." Slide's team says that "many of these products are no longer as active or haven't caught on as we originally hoped". A Google spokesperson informed the New York Times that most of the Slide team will continue to work at Google and many engineers will join YouTube. If Slide was a talent acquisition, then why Slide's team didn't work on Google+ and why popular games like SuperPoke weren't ported to Google+? AllThingsD offers some answers: "Although Slide as an independent start-up had not matched its lofty expectations and valuations — at as much as $500 million in a 2008 funding round — its acquisition brought Google some key assets: Social Web expertise at a time when it was dearly needed, and Levchin, who famously founded PayPal. But that was last August. Since then, Google has entrusted its social efforts to two of its existing executives, Vic Gundotra and Bradley Horowitz, who led the team that created Google+. Levchin was left on the fringes with Slide as an autonomous subsidiary, reporting to Google co-founder Sergey Brin." I got my poolparty invite about a month ago. When I requested it, it had sounded like a fun idea that could go far. By the time I got my invite, I'd been on Google+ over a month and the photo sharing on there was far superior. Contemplating Google's acquisition history a little, they probably bought Slide for a product/service that was in development or at least on the whiteboards at Slide, like with Where2 (Google Maps). The already existing apps were nothing more than a plus, I guess (At least in retrospect, maybe they already had an inclination to shut them down unless they gained surprise momentum).